More folks getting busted here and here! The Benihana incident is just another reason why the world is not ready for social networking. When you post something on the Internet, people, it is out there for the ENTIRE WORLD to see. 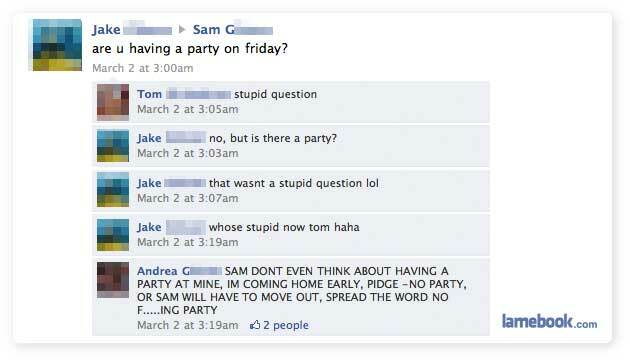 Notice how in the first one, Tom’s comment (which is number 1) is at 3:05 and the next one by Jake is at 3:03…..fail? He TAGGED the facebook page of the restaurant he was scamming? The Benihana one is stupid. First for tagging it, but then seriously, they go through every coupon and see if the person has more than one account? If they do, that’s Benihana’s programming fault, they need to honor the coupon. I find it hard to believe that a Benihana’s representative would feel the need to contact him directly. Sounds like a set up. I like Benihana’s, but the Devon Aoki special is too fatty for my tastes.